The annual "Giant Blue Whale Migration" brings hundreds of blue whales each spring/summer to the waters off Laguna Beach. Over 800 whales were viewed last summer (summer 2013). This peak whale watching time for Laguna Beach Whale Watching companies such as Newport Landing Whale Watching. Giant blue whales were once considered quite rare off southern California, but over the last five years this has changed dramatically with hundreds/thousands of giant blue whales spotted each year. These giants of the sea reach lengths of up to 90 feet and are the largest of all animals. Along with viewing these giants, the second largest whale in the world, the finback whale has also taken to the waters of southern California during the same months as the blue whales. Other varieties of whales are also possible during this time of year. Along with whales giant pods of common and bottlenose dolphin are also very likely with pods numbering in the hundreds or more dolphins frequently viewed. These dolphin pods come within arms reach as they play along side the whale watching ship. Just outside of Newport Bay is the beginning of one of the largest marine protected areas in southern California created to protect this rich ecosystem for future generations. The marine sanctuary covers over 15 miles and provides a haven for all marine creatures including whales and dolphin. The marine reserve stretches along much of the Newport & Laguna Beach coastline and along with being a mecca for whale watching also offers some of the most beautiful coastline in Southern California. The geography of the Newport coastline also creates ocean conditions that are more lake like with very calm waters ideal for whale watchers to fully enjoy the amazing migration. 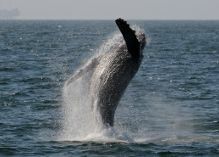 Join Newport Landing's Laguna Beach whale watching cruises offered daily and view the largest creature on earth.